When it comes to monitors, everyone has different priorities. Some people prioritize resolution and panel type. Others put more stock in response times and refresh rates. There are also those who go for monitors that will get a lot of style points. If aesthetics are important to you, consider the best ultra-thin monitors for your next purchase. In this guide, we have compiled the top ultra-slim monitors on the market. There is no need to spend a lot of time searching for viable options and narrowing down your list. We already did that for you. The monitors included in this guide have an exceptionally thin chassis, with some of the products measuring just around 0.3 inches thick at their thinnest points. Decent brightness and AMD FreeSync support. This features a VESA mounting interface. Good brightness and USB-C connectivity. The Dell S2718D is an excellent display for office work and general use, featuring a USB-C port for input and a USB hub, which makes it unique among the products on this list. It’s an IPS monitor with a QHD resolution and a 60 Hz refresh rate, which is good enough for non-gaming use. Compared to Dell UltraSharp monitors, the S2718D has a more stylish design, boasting an ultra-thin panel with thin bezels all around. It will look great next to a Dell XPS laptop or a MacBook, with the USB-C port allowing for easy compatibility with the latter. Unlike with most monitors, there is no VESA mounting interface on this unit, which is disappointing considering the limited ergonomics of the default stand. The controls are located on the stand base, on the top side, which is a setup not commonly seen in monitors. This makes the controls easy to see, which is not the case for monitors whose control buttons are on the back panel. While not as intuitive as the joystick control featured in LG monitors, the control scheme is user-friendly and doesn’t feel cheaply implemented. The on-screen display (OSD) itself is also well designed, featuring an organized layout with a good selection of options. For input, the S2718D has a one HDMI port and one USB-C port – the former is for all-around connectivity with different devices, including gaming consoles, while the latter is useful if you want to connect the monitor to a compatible laptop. The USB-C port supports video input and power delivery over a single cable, which is convenient. In addition, this Dell monitor includes one audio out port and a USB hub composed of two USB downstream ports. Like the control buttons, the connection ports are housed in the stand base, but instead of on the top side, they are located at the rear. The stand, which has a curved neck, attaches to the central area of the back panel and supports the monitor well, with no major wobbling issues. You can’t remove the stand because the input ports are on the base. Regarding ergonomics, the stand is limited, only offering tilt and swivel adjustments, but the good news is that the tilt and swivel adjustment ranges are good, especially the latter. Of the products listed here, this Dell monitor actually offers the best ergonomics, but only because it offers a swivel adjustment. The S2718D is a great monitor for productivity and general use – the large screen allows for easy multitasking while the high resolution translates to sharper texts and more detailed images. You can use it for content writing, web development, photo editing, creating presentations, and watching movies, among other things. The overall picture quality is good, with wide viewing angles, good brightness, and superb color accuracy. 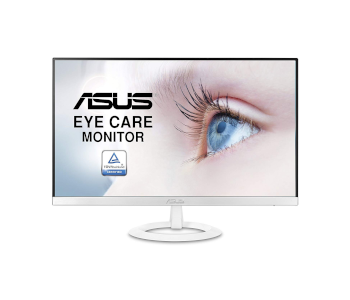 You can also use this monitor for casual gaming, especially if you mostly play story-driven or slow-paced games and care more about picture quality than response times. It’s great for games with pretty graphics – like Final Fantasy XV and Far Cry 5 – but for fast-paced competitive games, it’s not a suitable monitor. While it supports HDR content, this monitor is not a recommended monitor if you want a display with proper HDR implementation. If you want a monitor that actually offers good HDR performance, you’ll need to increase your budget all the way to $1,000-2,000. 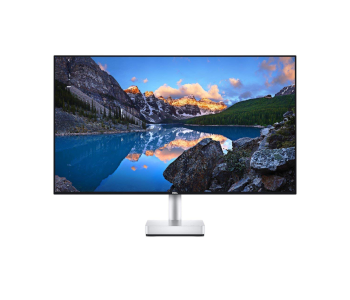 Overall, the S2718D is the best option if you are in the market for the best ultra-thin monitors, especially if you want a unit that includes a USB hub and a slightly more adjustable stand than that of most other ultra-thin monitors. It’s great for office work and general use and is decent enough for casual gaming, which makes it a suitable display for all-around use. Selling for just around $90, the Acer SB220Q is our recommended product if you want a budget monitor with an ultra-thin chassis. It’s an IPS monitor with a 1080p resolution, a 75 Hz refresh rate, and a 16:9 aspect ratio. 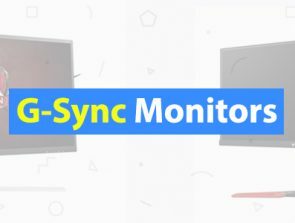 It’s a good monitor for all-around use, offering decent picture quality and good response time and FreeSync support for gaming. A 22-inch display, the SB220Q is an exceptionally thin monitor when viewed from the side, measuring just around 0.24 inches thick at the thinnest point. Unlike with our top pick, the monitor bulks out in the bottom section, where the main electronics are located. There is no VESA mounting interface on this unit, which is a common issue among ultra-thin monitors. If you want to mount the monitor to a third-party stand for better ergonomics, you’ll need to purchase a separate VESA mount adapter. For controls, there is a set of clickable buttons at the bottom of the monitor, similar to most monitors on the market. They are easy to use, with good tactile feedback. They are not as intuitive as the joystick control system featured in LG and Samsung monitors, though. Unsurprisingly, this Acer budget monitor only includes basic connectivity options, with no USB hub and no audio out port. It has one HDMI port and one VGA port for input, with FreeSync support limited to the former. Both input ports are outward-facing on the back panel, which makes them easy to access even when the monitor is placed close to the wall. The default stand is fixed, with no option to adjust the height. It has a round base with a small footprint and connects to the bottom section of the monitor. The only adjustment option is tilt, which can also be said for the default stand of most other cheap monitors. As mentioned earlier, you’ll need to purchase a separate VESA mount adapter if you want to mount the monitor to a different stand. The SB220Q is a suitable monitor for office work. It has good pixel density, thanks to the small screen size and the 1080p resolution. It has good viewing angles (which is a notable strength of IPS panels) and good color accuracy. 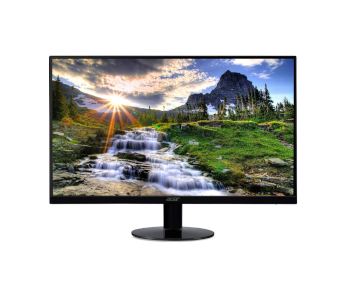 While not exactly the best option for professional photographers, video editors, and graphics designers, this budget IPS monitor is great for general office work, with its decent brightness and anti-glare screen coating allowing it to work well in a bright room. Featuring a 75 Hz refresh rate and a good response time, this Acer display is also a decent option for regular gaming. 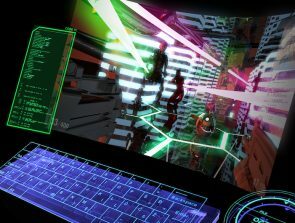 You can use it for single-player games where extremely fast response times and very high refresh rates are less important. It has FreeSync support as well, but the effective range is only 48-75 Hz, which isn’t exactly the widest range out there. Since it has an HDMI port, the SB220Q can be used for console gaming, whether you game on PS4 or Xbox One. Its 1080p resolution is perfectly fine for console gaming while the 75 Hz refresh rate is more than good enough since console games don’t typically go over 60 frames per second. If you want a budget-friendly ultra-thin monitor that’s good for all-around use, get the SB220Q. It has good build quality for a budget product and is easy to set up out of the box. It can connect with both modern and older computers and has a fairly decent overall picture quality. 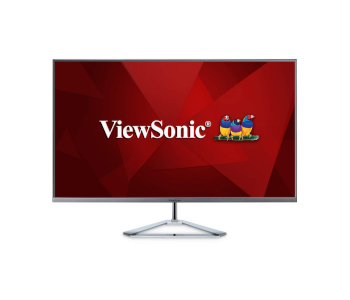 The ViewSonic VX3276-2K-MHD is a great option if you prefer an ultra-thin monitor with a screen larger than 30 inches. Featuring a QHD resolution and a 60 Hz standard refresh rate, this unit is great for multitasking and watching movies, with its generous screen space being especially beneficial for the former. You can get this monitor for around $250-300, which makes it more affordable than our top pick. The VX3276-2K-MHD is a 32-inch IPS display with a 16:9 aspect ratio, featuring a minimalist chassis with thin bezels at three sides and an anti-glare screen coating. It’s got an extremely thin panel that measures just 0.3 inches at the thinnest point. Like our budget pick, the monitor bulks out toward the bottom section, where the control buttons and input ports are located. Unlike many other ultra-thin monitors, this ViewSonic monitor features a VESA mount interface, which is great since the default stand has poor ergonomics. The mount interface has the common 100 x 100 mm VESA pattern, which allows for easy compatibility with most monitor arms and wall mounts. This monitor has a pair of built-in speakers as well, but they don’t sound good. If you are going to use this monitor for entertainment, we recommend using good-sounding external speakers or headphones for a better audio experience. Of the best ultra-thin monitors listed here, the VX3276-2K-MHD offers the most number of input ports, featuring two HDMI ports, one DisplayPort, and one Mini DisplayPort. The dual HDMI is great if you want to connect the monitor to multiple gaming consoles. Meanwhile, the Mini DisplayPort is useful if you want to use the monitor as a bigger screen for a compatible laptop. All input ports are down-facing on the back panel, along with the analog audio out port. While limited in adjustment options, the stand is sturdy and easily supports the large monitor. Instead of the usual rectangular-shaped base seen in many ViewSonic monitors, the stand base is triangular in shape, which makes for a unique look. The stand, which connects to the bottom area of the back panel, only offers tilt adjustment, with a maximum backward tilt of 15 degrees. 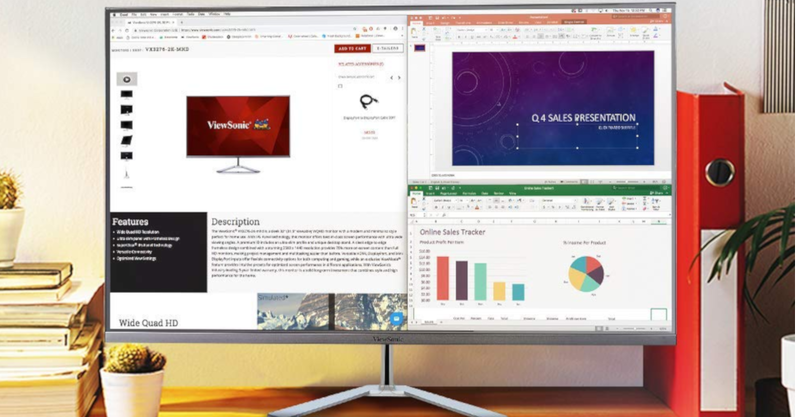 If you like to work with multiple windows open at the same time, you’ll love this ViewSonic QHD monitor. Although it has a lower pixel density compared to a 4K monitor with the same screen size, it’s great for multitasking. The generous screen space makes it easy to manage multiple windows, which is especially beneficial if you need to constantly look at references in a different window or tab. The overall picture quality is good. The monitor has good viewing angles, decent brightness, and great color accuracy, the latter of which is important for photo editing and other color-critical work. It works well in a moderately bright room, with the anti-glare screen coating helping reduce glare. On the other hand, the contrast ratio is subpar, which is a common issue among IPS monitors. For regular gaming and watching movies, the VX3276-2K-MHD is a good monitor. The large screen makes for a more immersive viewing experience compared to smaller monitors, while the QHD native resolution translates to more detailed images. If you mostly play single-player games with pretty visuals, this is a good monitor. But if you are into competitive gaming, you’ll be better off with a smaller, more gaming-focused display. All in all, the VX3276-2K-MHD is a great product that offers good value for the money. It’s one of the more affordable 32-inch QHD monitors on the market. It has good picture quality and decent gaming performance and features multiple input options for versatility. If you want a large ultra-thin monitor that works well for both productivity and entertainment, consider this ViewSonic product. Featuring an IPS panel with a 1080p resolution and a 60 Hz refresh rate, the Asus VZ239H-W is a good budget monitor selling for just around $150. You can use it for both office work and regular gaming, which is great if you don’t want to get a separate display specifically for gaming purposes. The VZ239H-W is a 23-inch display with a minimalist design, boasting an extremely thin chassis with very narrow bezels at the top and sides. The chassis is only 0.3 inches thick at the thinnest point, which is incredible. 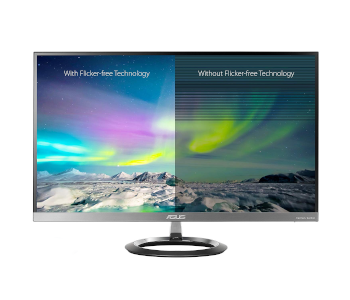 The screen has an anti-glare coating, which helps reduce glare when using the monitor in a bright room, while the back panel has a plain white finish. The monitor includes a pair of built-in speakers, which blast out from the back. They have a poor sound quality, though, which can also be said for most monitor speakers. For controls, this monitor features a set of clickable buttons at the bottom, on the right side. They are easy to use and don’t feel cheap, but they are not as good as the joystick control seen in LG monitors. There is no VESA mounting interface on this monitor, but you can use a third-party adapter if you want a wall-mounted setup or simply prefer a different stand. The VZ239H-W does not have a long list of connection ports, which isn’t really surprising considering the price point. It has one HDMI port, one VGA port, and one audio out port, all of which are outward-facing on the back panel, on the bottom-right side. The HDMI port means this monitor can be used as a display for PS4 and Xbox One consoles, while the VGA port is for connecting with older computers. Like with most ultra-thin monitors, the stand is fixed and doesn’t offer adjustment options outside of forward/backward tilt. It connects to the bottom area of the back panel, right next to the input ports. It supports the monitor well, with the ring-shaped base adding a bit of style. If you simply want to be able to adjust the monitor height and don’t really care about having full adjustment options, you can put the monitor on a platform-style monitor stand – like the AmazonBasics Adjustable Monitor Stand, which sells for just around $20. While not as versatile as high-end professional monitors, the VZ239H-W is a good monitor for office work and general use. The 1080p resolution looks great on the smaller screen while the 60 Hz refresh rate is perfectly fine for non-gaming use. The overall picture quality is decent for a budget IPS monitor, with good viewing angles, decent brightness, and good color accuracy. You can use this monitor for creating spreadsheets, content writing, coding, and research, among other things. But for photo editing, graphics design, and other similar types of work where being able to see images in more detail is important, this monitor is not the best option, as the 1080p resolution can be a limiting factor. For casual gaming, the VZ239H-W is a decent option, especially if you mostly play story-driven or slow-paced single-player games and don’t really care about extremely fast response times. It’s good for turn-based RPGs, real-time strategy games, and platformers, among others. But if you mainly play Overwatch, Counter-Strike: Global Offensive, and other fast-paced competitive games, this monitor is not a recommended option. Wrapping up, the VZ239H-W is a good option if you want a basic 1080p monitor for all-around use. It has decent picture quality and good build quality for a budget product. If you don’t like our budget pick and can spend around $50 more on an ultra-thin monitor, get this Asus product instead. One of the best monitors with good speakers, the Asus MZ27AQ is a good alternative to our top pick if you want a more affordable option. It has the same screen size, panel type, and resolution, but it sells for around $100 less. 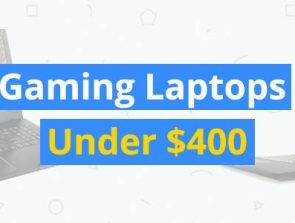 It’s an all-around monitor suitable for office work, general usage, and casual gaming, boasting excellent color accuracy and wide viewing angles. Regarding the core design, the MZ27AQ looks very similar to the Asus VZ239H-W, with only a few differences in some areas. It’s got an extremely thin panel when viewed from the side, with the thinnest point measuring just around 0.3 inches thick. Unlike all the other monitors on this list, this unit features a joystick for OSD control. Located on the back panel, on the thicker bottom section, the small joystick is more intuitive than the usual physical buttons seen in other monitors. There is no VESA mounting interface on this unit, which is disappointing considering the default stand has mediocre ergonomics. But on the bright side, it has good built-in speakers, which can’t be said for most other monitors out there, even those selling for twice the price. Co-developed by Harman Kardon, the monitor’s sound system – composed of two 6-watt internal speakers and a 5-watt subwoofer – is good enough for entertainment and regular use. For input, this Asus monitor has two HDMI ports and one DisplayPort, the latter of which is more notable considering many ultra-thin monitors only include the former. It has an audio out port as well, but there are no USB ports on this monitor, which might disappoint some of you considering the price point. Since the monitor has three digital input options, there is no need to constantly switch cables if you want to use it for both office work and console gaming. You can use one of the HDMI ports for your gaming console, and then connect your computer using the DisplayPort or the other HDMI port. All connection ports are outward-facing on the back panel, which makes them easy to see. The stand is well built and easily supports the monitor, featuring the same ring-shaped base seen in other monitors in the Asus Designo series. It attaches to the bottom area of the monitor, which is significantly bulkier than the upper part. Concerning ergonomics, the stand is mediocre, only offering a tilt option, which is disappointing. Like our top pick, the MZ27AQ is a great display for productivity, with its good screen real estate and QHD resolution allowing for easy multitasking. It has better pixel density than a 27-inch 1080p monitor, so it looks great even if you sit less than three feet from the screen. The overall picture quality is good, with excellent color accuracy and good viewing angles. For entertainment, this ultra-thin monitor is also good. The 1440p resolution translates to more detailed images while the large screen offers a more immersive viewing experience compared to smaller 24-inch monitors. You can use this monitor for regular or casual gaming, especially if you mostly play single-player games with pretty graphics and don’t care about extremely fast response times. On the flip side, the MZ27AQ has a subpar contrast ratio, which isn’t really surprising consider the IPS panel. If you want a higher contrast ratio for more vibrant images when watching movies and playing games, consider the best VA monitors instead. Overall, the MZ27AQ is a great monitor for all-around use. It has good overall picture quality and fairly decent gaming performance. It has dual HDMI input ports, which is a big plus for some people, and even comes with a good sound system, which is a nice bonus. If you like the screen size, panel type, and resolution of our top pick but prefer a more affordable option, check out this Asus product. 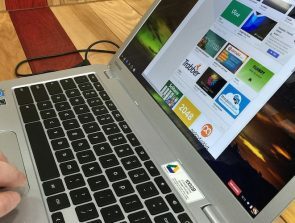 What are the Pros and Cons of using a Chromebook?